I normally don’t do gear lists – largely because I’m not a gear whore – but I’ve gotten a few requests for descriptions of what we’re carrying, so I figure, why not. I’m doing this from memory, so I’m sure I’ll forget a few things. The goal of our trip is to ride trail. Rough, smooth, rocky, rooty – and to be able to enjoy it. We make our sacrifices for this goal, but we still want to feel comfortable sleeping 8 hours a night and hanging out at camp some. Our basic plan is to carry stuff that’ll last without being too heavy. We know the misery of riding with heavy bikes, so we cut weight where we can without breaking the bank. We go fairly minimalist with a few leisure items. Well, I carry a few leisure items, I don’t think Scott has any. Bikes: The goal is to ride as much trail and as little road as possible. Thus, dual-suspension is awesome, as are big wheels. Me: Salsa Spearfish w/ 130 mm fork. We’re running Panaracer Rampages for tires, some of the only tires we’ve found that hold up to Tucson and desert touring. Pretty basic parts, 2×10 drivetrains, hydraulic disc brakes, clipless pedals. Scott’s running a 20t inner chainring, I’m running a 22. I’ll be switching to a 20 as soon as we get to Durango. Scott’s also running a Spyderflex saddle with a dropper post. Bags: We’ve found that for trails, it’s best to have weight both on the bikes and in packs. Since Scott can’t run a seat bag, he has more in the pack and less on the bike. I do everything but water and the iPad (and spare food when needed) on the bike. Me: All Revelate Designs – seatbag, frame bag, Sweetroll, Pocket-thingy. Gastank. Feedbag. Most of these bags have come with me racing and I love them all. Eric does good. On my back, an Osprey Hornet (small one) which is proving to be the bag that won’t die. Scott: Revelate pocket thingy holding a compression sack on handlebars, Gastank, Jerry Can and two feedbags. On his back, a bigger 25L Osprey pack. Sleeping: We can’t weather an intense storm, nor be comfortable below freezing, but our “race” setups seem to be good enough so far. We have warmer bags sitting in Boulder ready to be shipped if it gets too cold for comfort. 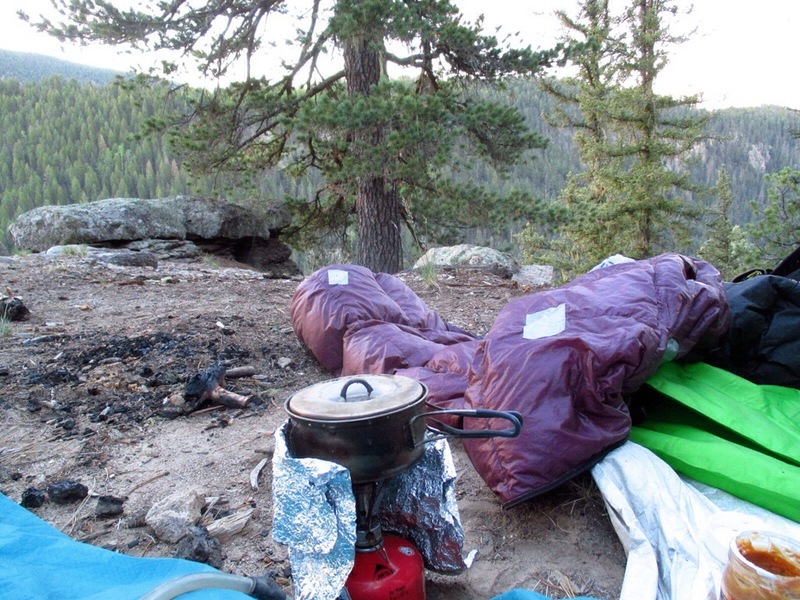 Instead of a tent, we carry a 10 x 8′ tarp. It’s not cuban fiber light, but it’s not bad (made of Silnylon). We’ve set it up once this trip as we prefer sleeping under the stars whenever possible. Me: Montbell 40 degree down bag, Montbell sleeping bag “cover” (this might get swapped for a real bivy in CO), Big Agnes sleeping pad (lightest they make — Air Core SL). Clothing: I think this is where we carry less than most hikers. Me: Two pairs of chamois (girls, trust me on this one), baggy shorts, Columbia ProFishingGear long-sleeve shirt, fleece knee warmers, Swiftwick wool socks, Montbell light down jacket, longsleeve thin wool top, hat, warm fuzzy socks (luxury item), bike gloves, Pearl Izumi hike-a-bike shoes, rain jacket. I generally sleep in everything minus the rain jacket and chamois. Scott: Chamois, baggy shorts, long sleeve collared shirt, arm warmers, knee warmers, Swiftwick wool socks, medium weight down jacket, rain jacket, hat, bike gloves, Pearl Izumi hike-a-bike shoes. Lights: We’re not planning on riding at night, but we could. Me: Mini light attached to helmet for camp stuff. Light and Motion rechargeable light in case we have to ride at night. This might get replaced in Durango. Scott: Princeton Tech Eos. Runs on AAA’s. I’ll probably go this route north of here. Water: We had capacity for about 200 oz each through NM. We’re reducing that now that we’re more concerned about snow than heat. We both have a 100 oz bladder and Scott has two bottles. I carry a spare 20 oz Dr. Pepper bottle for when we pick up water close to dinner. We’re using Sawyer in-line filters which we love and have had no issues with. Electronics: We both have Smartphones and I’m carrying an iPad mini with keyboard. We have chargers for these, headphones, and a few other wires. Navigation: We’re doing our best to follow the Ley Route on the CDT. 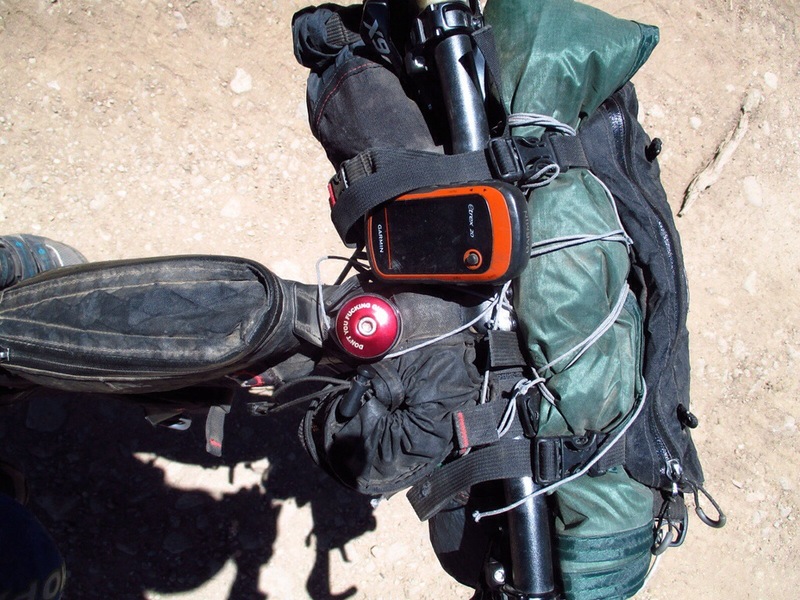 Scott uses a Garmin eTrex 30 loaded with a bunch of tracks, alternates, and way-points. I carry a eTrex 20 as a backup. Scott also has the Guthook App on his phone for a better overview of what’s to come. We bought a map of the forest north of Cuba and sent it home from Ghost Ranch. Tools: Multitool with chaintool and knife, 2 pumps, quick links, duct tape, various nuts and bolts, derailleur cable, two tubes, two 2-ounce bottles of Stans, tire plugs, patch kit, full sized shock pump (we may replace it with a smaller one). Other stuff: Small first aid kit, small cable lock (keeping honest people honest), bathroom stuff (toothbrushes, travel sized toothpaste, floss, Scott’s eye care stuff and glasses), sunscreen, small thing of chamois cream that we use once in a blue moon, sunglasses. Me: GoPro 3+ hero (this may get sent home) and a Canon Powershot something or other. Scott: Cannon Powershot Elf 110. I think that without food and water, we’re probably at about 10 lbs or so. We can comfortably carry three full days and two nights of food. We can get in three nights worth, but we start to whine about it and riding starts to get sub-fun, especially if we’re hauling a lot of water. It’s pretty simple. Refined through racing, adapted for comfort. My daughter and I enjoyed meeting you and Scott on the trail the evening before Lemhi Pass. 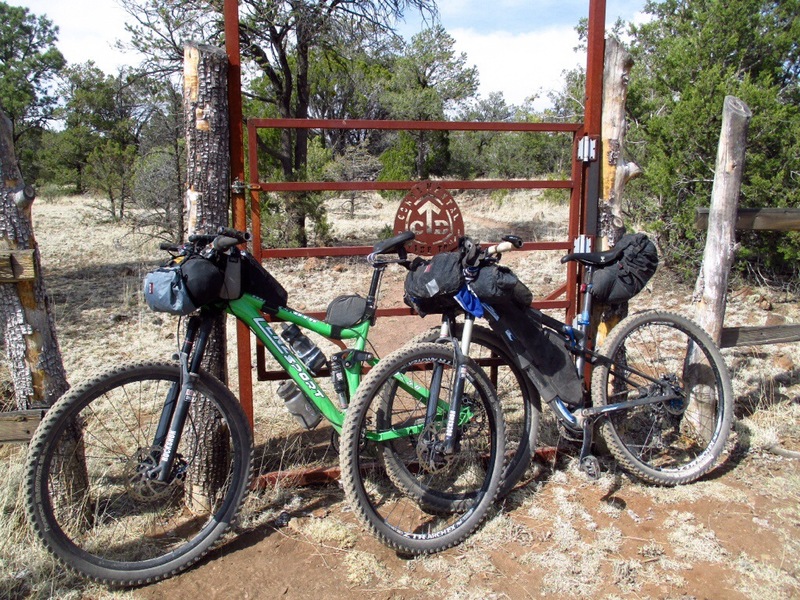 We were section hiking but are also bikepackers (we biked the CT then the CDT in New Mexico a few summers back. I think there are posts on this site somewhere.) What you are doing is truly amazing. I hope your trip is ending well. It did not dawn on me until after we met who you were (having seen your past postings on this site) If anyone was to ride the CDT it would be you and Scott. I have to credit you guys and bikepacking.net for getting Cassi and I involved in long distance trails back in 2009 when we rode the CT.
Hey Tony — great to hear from you. I was able to dig up your CDT reports from when you rode across NM. That was fun to check out. Wish I could have picked your brain a little before our trip! That’s super cool that you can have so many adventures with your daughter. We were wondering how the rest of your MT hike went. How far did you guys make it?